So I found the perfect dishwasher at a heavily discounted price at Home Depot. 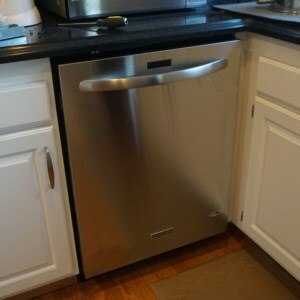 Regularly, the dishwasher cost $989, but discounted over 50% to $499 + tax (free shipping), I couldn't resist the Architect Series II Top Control Dishwasher in Stainless Steel with Stainless Steel Tub, Ultra-Fine Filter, 43 dBA to replace the dishwasher that came with the house that commonly left dirty dishes. During the checkout process, I was surprised to see the a $79 fee to install. Naturally, I decided to do a quick YouTube search for dishwasher install instructions. What I found looks simple! There are basically three connectors that need to be disconnected from the old dishwasher and replaced and added back to the new dishwasher. The water input pipe, the water drain pipe, and the electrical cable. The required tools are basic that any novice homeowner should already own. Here are the tools you will need for the installation. The video I followed below was a bit old, so some of the tools were slightly different, given the newer models of the dishwasher. Make sure the power is shut off at the electrical box (sometimes in the garage or master bedroom closet). Sometimes the box isn't well labeled, but just make sure your old dishwasher doesn't power on before you begin the process. Don't worry if water comes out of your new dishwasher. Each unit is tested before it leaves the factory. Have plenty of old towels around to soak up excess water from the old (and even the new) dishwasher. Make sure not to pierce any of the supplied pipes. When possible, it is much easier when the dishwasher is on it's back. Should I Install a Dishwasher Myself? Overall, it took about 3-4 hours for me to remove the old dishwasher and install the new dishwasher. If I were to do this installation again, I could probably get it done in half the time. I'd say the entire process is an intermediate skill level. Doing the installation is more or less easy, but any part done incorrectly can result in water damage. Carefully follow the instructions, and you will have saved yourself ~$90, and you'll understand what can go wrong and possibly fix a dishwasher in the future.